Anyone can ride a recumbent bike, whatever his or hers physical condition. Recumbents are not for racing only. Traditionally the event takes place in the first weekend of August and serves both as a racing event and as a general bent riders' meet-up. e.g. Pekka broke the masters Hour World Record in trike category on 2016. On 2016 we organized Nordic Recumbent Championships. Our active members have participated to the World Championships in Netherlands and France and amazed folks in National races in Denmark and France. Recumbent bike constructions take endless forms, you can find two-, three and four wheelers, short and long wheelbases, low and high racers, all kind of cruisers as well as fully faired velomobiles. There's no limit, there's no UCI rules. Many of us even build our very own individual machines. discussion forum, which is an active Finnish site for recumbent enthusiasts. Mastermind of the event. Race commander, track maister. Teppo takes care of everything. Chairman of the board. Regular competitor in international races. Carbon fiber specialist. HC recumbent rider and builder from the North Karelian town of Joensuu. Velomobile rider from the western flatlands. Reputed social media activist. "Fine-tuning by welding" specialist from Manchester Finland. RRF member subscription fee is €20.00 for 2018. This fee can be paid with the same transaction as the race registration. You can pay either on-line using PayPal links below or by wire transfer. If you pay for the family, please list other family participants to the payment notes! Registration with RRF membership fee €55.00 (after July 15th). Only race registration €45.00 (after July 15th). Only RRF membership fee €20.00. Rider classification follows WRRA rules. Vehicle classification follows WRRA rules, added with velomobile and tandem classes. Drafting is allowed except in one hour race. 200 m race will be started one by one, individually. Helmet is not mandatory, but is highly recommended. One operational breaking device is mandatory. A rear view mirror is recommended. Everyone is responsible for his/hers own health. Do evaluate your condition regularly during the races. Organiser only provides the track for the event - no responsibilities of any kind can be delegated to the organising party. Organiser recommends checking and acquiring suitable personal insurance for the weekend. A waiver of liability will be signed during registration and before races. RRF race is already a tradition in Finnish recumbent scene, Finnish Championships races has existed since 2011. The weekend-long meetup traditionally combines competition events with relaxed test riding and get-together of recumbent enthusiasts. 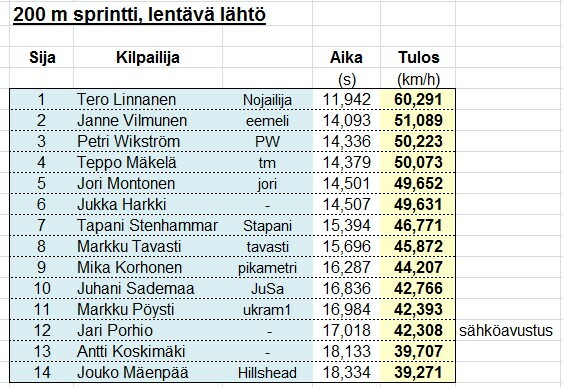 Even though the competition for the Finnish Championship title is fierce, everyone is welcome on the track. Many participants only race against themselves in a marathon event and take the opportunity to test their personal limits in safe environment. In 12 hour event the average speed varies from 15 km/h to 60 km/h. The track’s open for everyone! 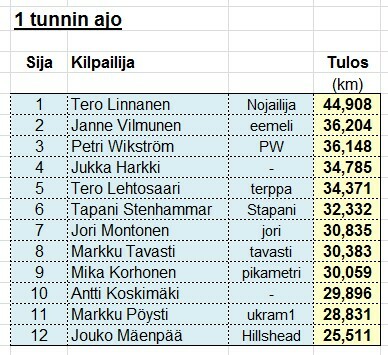 The event is open for any kind of bicycle, but - obviously - you can race for Finnish Recumbent Championships title only if you ride with a recumbent bike (check the classifications and rules from the separate info-box). The event is aimed at individuals interested in recumbent cycling. Some of the participants are the true pioneers of the recumbent scene in Nordics while others are racing for the first time. Racing gear varies from amazing DIY contraptions to factory-made high-tech racers.